Why is Twitter making it easier to buy from Amazon? They elegantly unpack shortened Amazon URLs to create a very nice product page on Twitter.com (below). I saw this for the first time a few nights ago and erroneously thought it was a new feature but turns out it’s been live since June and also supports similar displays for a number of other services (Foursquare, Meetup, etc). Most people assume Twitter’s goal with this layout is to play the role of Amazon affiliate and make money from ecommerce transactions. They certainly might be one strategy but the more immediate business motive has less to do with participating in transactions and more to do with increasing the value of advertising on Twitter. What? How does this display help Promoted Tweets/Accounts/Trends? What you are willing to pay for an ad is a function of the value it drives for you. Twitter sells Promoted products to advertisers who are willing to assign some ROI to the value of a RT, a follow, etc but ultimately these actions must turn into a sale. The more Twitter can do to increase conversion rates, the more they are worth as a channel to advertisers. If Twitter can create an onsite environment which leads to more sales for Amazon, then Amazon is willing to pay more per click since the conversion rate is high. 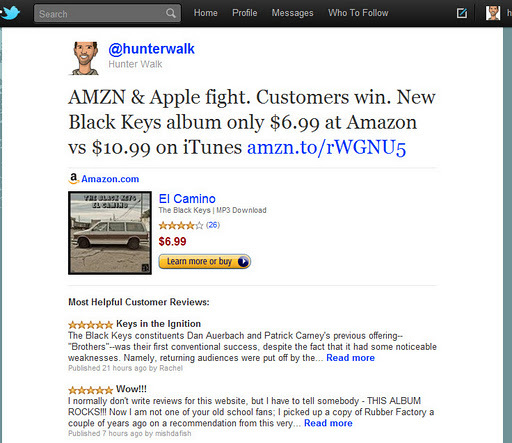 Let’s say the above UX doubled the CTR through to the Amazon website for El Camino sales. Accordingly, this also just doubled the value the get from Twitter and what Amazon would be willing to pay to be a Promoted Account since each new follower’s lifetime value is higher than it was before this feature launch. Twitter will continue to create better, more immersive onsite designs around their data. Sure it’s about a great user experience but ultimately it’s also about increasing the value to advertisers. ← Foursquare: Future giftcard player?